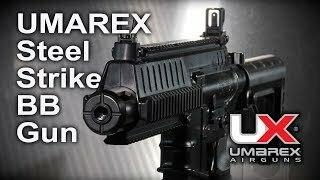 Light up the range with the Umarex Steel Strike! 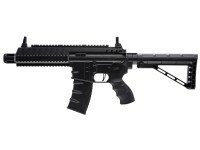 The Umarex Steel Strike delivers rapid-fire action with blistering semi-auto shots. 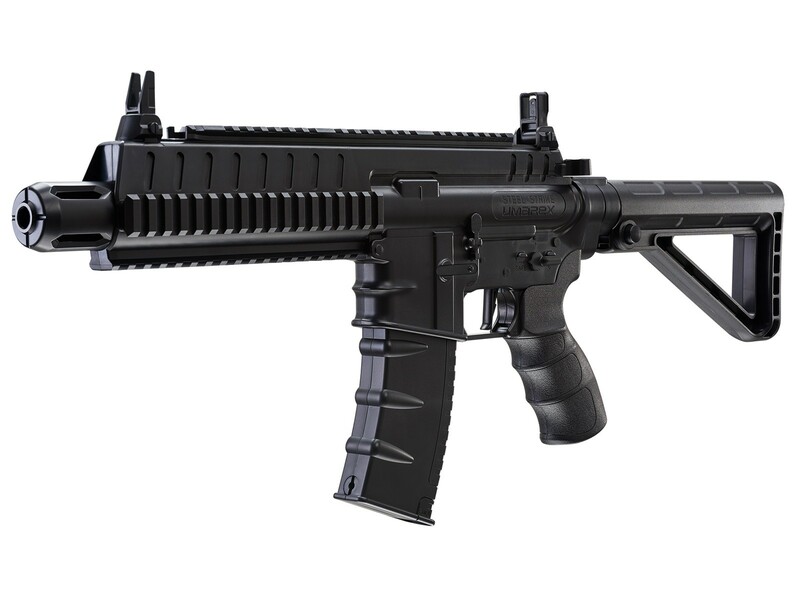 With a design rooted in combat carbines, the Steel Strike looks, feels, and controls just like the real thing. Load up two 12-gram CO2 cartridges to jump into the action with a barrage of BB fire! Featuring rapid-fire six-shot burst action a 900 round BB reservoir that feeds a 30rd magazine, paper targets and tin cans will quiver before this BB blaster. 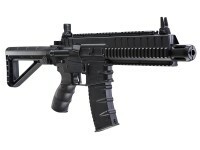 Open the Strike’s adjustable stock to reveal the CO2 chamber, then load up its massive 900 round BB reservoir and shoot 30 rounds before needing to refill the magazine. As for optics and accessories, you have a lot of options my friend! Use the included flip-up sights or mount your choice of red-dot sights, scopes, grips, lasers or lights on one of the four Weaver/Picatinny mounts. 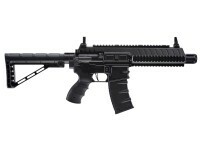 If you love endless ammo, rapid-fire, all in a tactical carbine package, make the Steel Strike yours. What others should know: I would not recomend buyingthis rifle it dosent seem to be durable enough to withstand its own power very disapointed. Things I liked: The burst on this gun is awesome. Super fast cyclic rate. The BBs were making a quarter size group with each trigger pull. The trigger is also way better than I expected, a bit of take-up and a clean break. Made me think it wasn't an airgun for a while. Loading the CO2 is easy, just be careful when changing them out. If there's still a bunch of CO2 it can pop the oring off the plug if you go to fast. Things I would have changed: Muzzle end is not removable. Would be cooler if it was like an A2 birdcage. Loading the mag does take some time. Pull the tab down shake, pull tab shake, pull tab shake. With some practice i was able to get the mag filled pretty easy. What others should know: Fun plinker. Cooler than I expected. Comment #2, When I first fired it, I realized it was more than I could have imagined. Fix the problem and get it back asap. I would love to have this model working 100%. my trigger locks up and it won't go to safe. Hoping for a working replacement. Figuered out magazine loading. The magazine needs to be horizontal to the ground to get all of the bbs in it. You still need to shake it a bit, but point the barrel all the way to the ground and then pull the tab. This will fill the magazine between 26 and 30 bbs. Things I would have changed: The magazine design is flawed, after many attempts the most bbs I can get loaded before going dry is 8-9, not the 30 as the gun claims. There is no window or slot to even confirm the amount in the feeder. And the plastic plunger is very cheap feeling, like it will snap off if much force is applied to it. So if you run 6 shot burst you get 1 partial sec of fired bbs, then you have to pull the mag and attempt to get more into the feeder. The description also stated for the entire year of manufacturer delays on the bb gun that is was full auto, the box states that no where. Only single shot or 6 shot burst. What others should know: This product is a major disappointment, I would expect more from umarex given other excellent offerings in the replica line. Expect frustration repeatedly if buying this gun, I ordered two and they will probably just be wall hangers. 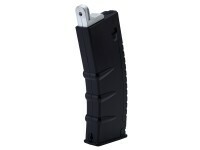 Umarex needs to fix the poorly designed magazine and send them free of charge to early buyers of this steel strike model. 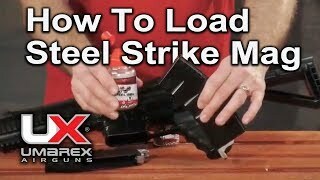 https://www.youtube.com/watch?v=A0nVAQcvycs&t=15s The video demonstrates how easy the magazine is to load. Just point the muzzle to hte ground and pull the feeder out. Can this gun be dry fired? At this point, not sure. Is this more reliable than the steel force/storm? Had two that lasted a week or so and broke.Extemely fun while they lasted. I had the same problem with all 4 Steel Forces I bought. But my Gawd, were they fun. RWS Spring Cylinder Oil, 1 oz.